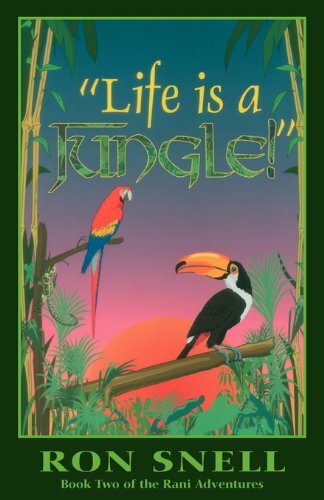 "Life is a Jungle" by Ron Snell is Book 2 of The Rani Adventures, also known as The Jungle Series. The second edition is 5 1/2 inches by 8 1/2 inches. The first edition was 4 1/4 inches by 7 inches. Type is bigger and easier to read in the second edition. 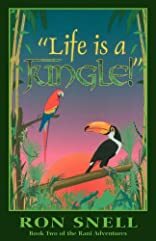 Extremely popular with the Christian homeschool audience as well as people of all ages, The Rani Adventures depict what life was like for a young missionary kid growing up in the rain forests of Peru. "My high school years were like a television series," Snell writes. "Hiking into the middle of the Amazon jungle to build an airstrip and nearly starving to death. Greeting the president of Peru as he stepped out of his chopper to visit our school. Spoon feeding water to feverish Machiguengas and helping bury the ones who died. "I never thought it unusual to have a 16-foot anaconda slithering around in our science class. Or going barefoot to school, getting stuck in the middle of landslides or getting cheap thrills careening through the streets of Lima in taxis in the dead of night. "What was I doing in Peru? "Well, that's a long story. A funny, sad, sometimes unbelievable story. It's what this book is about--a really crazy family that loved adventure, loved God and loved the Machiguengas."